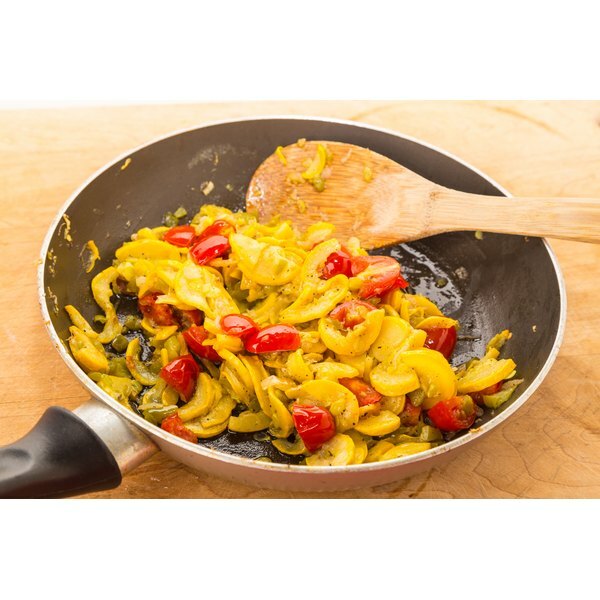 Sauteed vegetables in a pan with oil. 3 How Long to Cook Steak at 150 Degrees in a Slow Cooker? Sauteing refers to cooking a food quickly over a medium to high heat. The word, "saute" comes from a French word meaning "to jump." 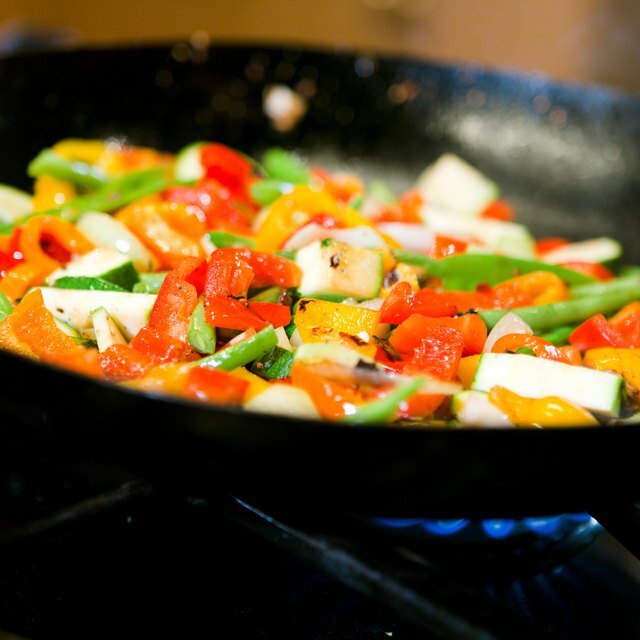 Traditionally, when sauteing, the chef shakes the pan a little, causing the foods to jump. You can use any kind of fat or oil to saute your food. This method retains the flavor and works well for vegetables. Chop up vegetables that are thick and crisp, such as onions, bell peppers, zucchini and squash, into bite-size pieces or long strips. Coat your saute pan generously with olive oil. Preheat it for one minute over medium heat. Place the chopped vegetables in the saute pan. Cook for two minutes or until the vegetables are soft enough to easily slide a fork through them. Stir constantly so that the vegetables are only lightly browned. Add leafier vegetables and other small aromatics, such as minced garlic, fresh spinach and whole or chopped fresh basil, toward the end of the two minutes to avoid frying them. Stir small aromatics constantly until they are lightly browned and leafy vegetables until they are wilted. Stir in seasonings, such as salt and pepper, at the end of the two minutes or right before serving. Remove the vegetables from the heat. Serve immediately as a side dish, or as a main dish with steamed rice. Vary the color of your vegetables to add nutritious eye-appeal to the dish. Keep in mind that it's important to eat a wide variety of colorful vegetables and fruits every day, as the variety will provide you with numerous vitamins, minerals and fiber, notes the Centers for Disease Control and Prevention. Sauteing should only lightly brown and soften vegetables. Reduce the heat little by little if the vegetables are getting too brown. Laura Pinell earned a bachelor's degree in agricultural sciences and education from the University of Tennessee. As a certified high school teacher, she focuses her writing on education, leadership and entrepreneurship.